Re: Where's This Say, Please? I thought Cheddar was in Somerset, but maybe it's on the border. I wonder if it's Chedworth mistranscribed as Cheddar by the enumerator. Cheers, peeps. Swine, isn't it? Certainly looks like Cheddar, in Glos. But, the actual Cheddar is well south of even Bristol. It most certainly is ~ and always has been ~ firmly within Somerset. Just banging my head against my all time brick wall, again. Going over some old notes. Christ, my head hurts! Again! 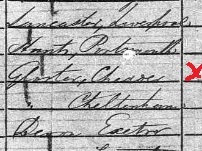 We can't see the original return that the enumerator was trying to copy, so if it was not written clearly then only the well-known places would be recognisable. Two long shots in Glos would be CLEEVE near Westbury on Severn, and (Bishop's) CLEEVE near Cheltenham. I'm not sure the middle letters are 'd' - there are no long upstrokes such as on the writer's letter l, h & t, and there are no other letter 'd's in the sample with which to compare. Also the second 'd' looks similar the letter 'o' to me. it would be useful perhaps to see more of the page. Which census ? What's his name?